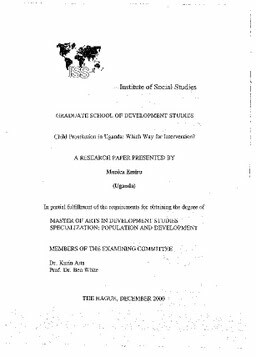 Erasmus University Thesis Repository: Child Prostitution in Uganda: Which Way for Intervention? Child Prostitution in Uganda: Which Way for Intervention? Child prostitution is just beginning to be addressed in Uganda. It was not directly addressed in 1990, when Uganda decided to amend the laws pertaining to sexual abuse with the view of making the punishment for such crimes more stringent in the hope that it would reduce the commission of such offences. This oversight was probably because the magnitude of the problem was unclear. However, increasing incidences of child prostitution are being reported in the Ugandan press and by other sources on sexual abuse and child labour. This cannot help but have serious effects on the development of these children. Furthermore, these reports also point out that not only is child prostitution affecting the girl child (as originally was the case) but male children too are increasingly involved.